Scientific American / Farrar, Straus and Giro, 9780374141042, 288pp. For too long, we've thought of fathers as little more than sources of authority and economic stability in the lives of their children. Yet cutting-edge studies drawing unexpected links between fathers and children are forcing us to reconsider our assumptions and ask new questions: What changes occur in men when they are "expecting"? Do fathers affect their children's language development? What are the risks and rewards of being an older-than-average father at the time the child is born? What happens to a father's hormone levels at every stage of his child's development, and can a child influence the father's health? Just how much do fathers matter? In Do Fathers Matter? 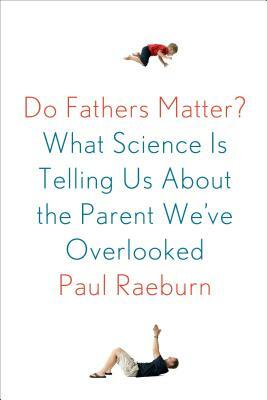 the award-winning journalist and father of five Paul Raeburn overturns the many myths and stereotypes of fatherhood as he examines the latest scientific findings on the parent we've often overlooked. Drawing on research from neuroscientists, animal behaviorists, geneticists, and developmental psychologists, among others, Raeburn takes us through the various stages of fatherhood, revealing the profound physiological connections between children and fathers, from conception through adolescence and into adulthood-and the importance of the relationship between mothers and fathers. In the process, he challenges the legacy of Freud and mainstream views of parental attachment, and also explains how we can become better parents ourselves. Ultimately, Raeburn shows how the role of the father is distinctly different from that of the mother, and that embracing fathers' significance in the lives of young people is something we can all benefit from. An engrossing, eye-opening, and deeply personal book that makes a case for a new perspective on the importance of fathers in our lives no matter what our family structure, Do Fathers Matter? will change the way we view fatherhood today. Paul Raeburn is a journalist and blogger and the author of four books, including Acquainted with the Night: A Parent's Quest to Understand Depression and Bipolar Disorder in His Children. Raeburn's stories have appeared in Discover, The Huffington Post, The New York Times Magazine, Scientific American, and Psychology Today, among many others. A past president of the National Association of Science Writers, Raeburn has been the chief media critic at the Knight Science Journalism Tracker; the science editor at BusinessWeek and the Associated Press; and the creator and host of Innovations in Medicine and The Washington Health Report on XM satellite radio. A native of Detroit, Raeburn now lives in New York City with his wife, the writer Elizabeth DeVita-Raeburn, and their two children.